RunSnakeRun is a small GUI utility that allows you to view (Python) cProfile or Profile profiler dumps in a sortable GUI view. It allows you to explore the profiler information using a "square map" visualization or sortable tables of data. 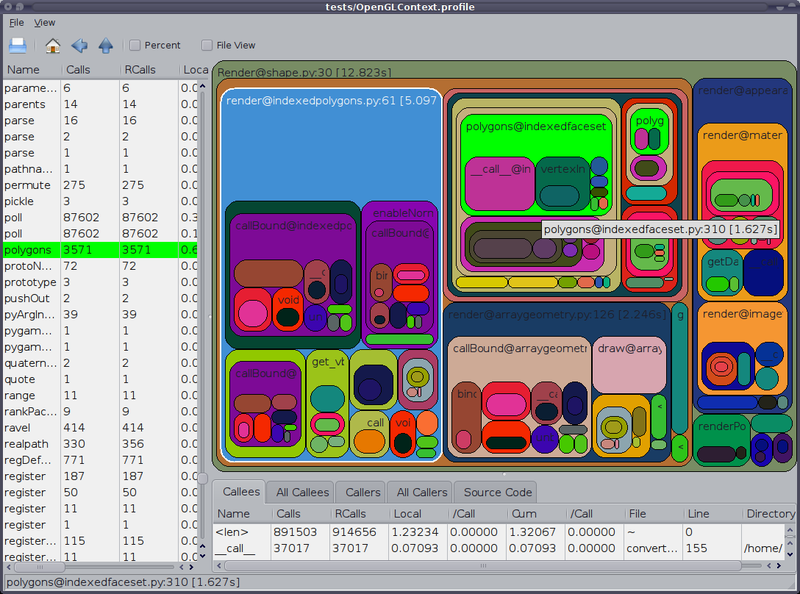 It also (experimentally) allows you to view the output of the Meliae "memory analysis" tool using the same basic visualisations. RunSnakeRun and SquareMap will install well in a VirtualEnv if you would like to keep them isolated (normally you do not want to use the --no-site-packages flag if you are doing this). I recommend this approach rather than using easy_install directly on your Linux/OS-X host. You will require a modern wxPython (e.g. 2.8) and Python 2.x (e.g. 2.5 through 2.7) installation. The setup will create a script named "runsnake" on Linux machines which launches the profile viewer. On OS-X machines a wrapper script runsnake is created that runs the runsnake32 executable with a flag to tell Python to use the 32-bit implementation (for wxPython compatibility). On Win32 machines, a Scripts\runsnake.exe executable is created. If you have added your scripts directory to the PATH then this will be available from the command-line. Click on any column title to sort by that property within that list. Select a record in the left-most list view to see a breakdown of that record in the right-side list views. Choose the appropriate view on the right via the tabs. 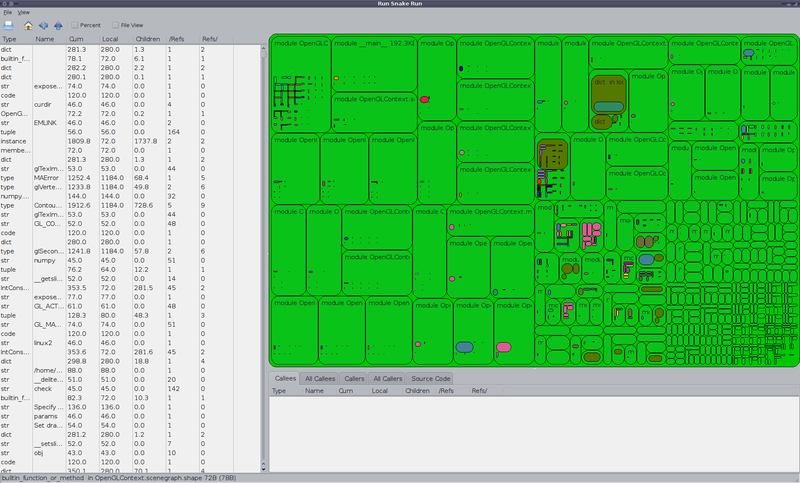 You can resize the borders between the lists and square-map views. You can select a package/module/function hierarchic view via the menus. You can also toggle use of percentage displays there. Note: this feature is considered experimental, the memory consumed loading even a tiny meliae dump is enormous, so real-world programs will make RunSnakeRun quite slow and require a very large amount of RAM (far more than the process being viewed). The memory dump will generally be quite large (e.g. 2MB to describe an application with 200KB of user-controllable memory usage (i.e. not the interpreter itself)) and for any real application will take an extremely long time to load (multiple minutes for 16MB dumps). Even with those simplifications, however, the program is tracking most ints, strings, tuples, lists, etc. separately, which uses a large amount of RAM and slows down the GUI substantially. You can contact me directly if you'd like to contribute. Or you can just set up a bzr branch on LaunchPad and request a merge. configuration/storage of preferences such as column widths, rounded corners, padding, etc. 1.0.4 -- Add preliminary support for standard cProfile/profile profile results, note that we do not load cProfile results incrementally. Switch to numpy support from Numeric. Use setuptools for distribution. Provide source repository access.